In her exclusive RED HOT EBOOK OF SECRETS series, expert Relationship and Health & Wellness coach Abbe Lang reveals the secrets to successful relationships and staying young and healthy. Buy the series today! Do you want to meet and marry the man of your dreams? Do you want your boyfriend or husband to treat you like a princess? Do you want to rekindle the desire he had for you when you were first dating? Do you want to have your man spoil and adore you forever? Relationships … they can be difficult to understand, but not impossible. Abbe Lang understands the anguish that can come with relationships, and now she has a great resource for you that will help you avoid the anguish and have a thriving relationship. With her new bundle of eBooks, Abbe will equip you to handle the situation when your relationship is on the rocks. Abbe’s relationship advice secrets will show you have to have a solid relationship and live a happier, more fulfilled life. 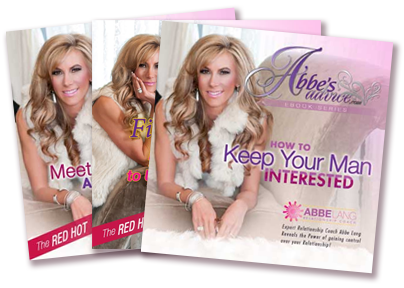 Let Abbe guide you to have the best relationship possible by implementing her simple tools and live the life of your dreams! Take advantage of this exclusive offer, and order the Relationship Bundle now. Let’s face it, are you frustrated and confused by your man? Do intimate relationships frustrate and confuse the heck out of you? Are you often at a loss as to why your man acts the way he does? Don’t remain in the land of the lost, but find your way toward understanding him. Finally, there is something you can do about it.